The dull weather may be dampening the nation’s spirits but not its front doors, according to leading composite door company Truedor. Together with architect and property expert, George Clarke, ambassador for Truedor, it’s released its Top 10 New Year's Colour List based on recent sales and, driven by Pantone’s ultra violet colour of the year, the colour purple is top as UK homeowners wave ta-ta to blah and unleash their inner craving for colour. Grey was there for us in 2017, a safe bet like a trusted friend or comfy slippers. But with bold purple hues and a bevy of other exciting shades on the horizon, it seems a front door is proving the ideal place to try a new colour, rather than a total interior overhaul. Whilst traditional colours still have their place on the Truedor list of best-sellers, the company is experiencing greater demand for bespoke shades as homeowners look to put a personal stamp on their property. With access to the RAL paint rainbow, Truedor offers doors in almost any shade, a world of colour possibilities for exterior and interior doors. 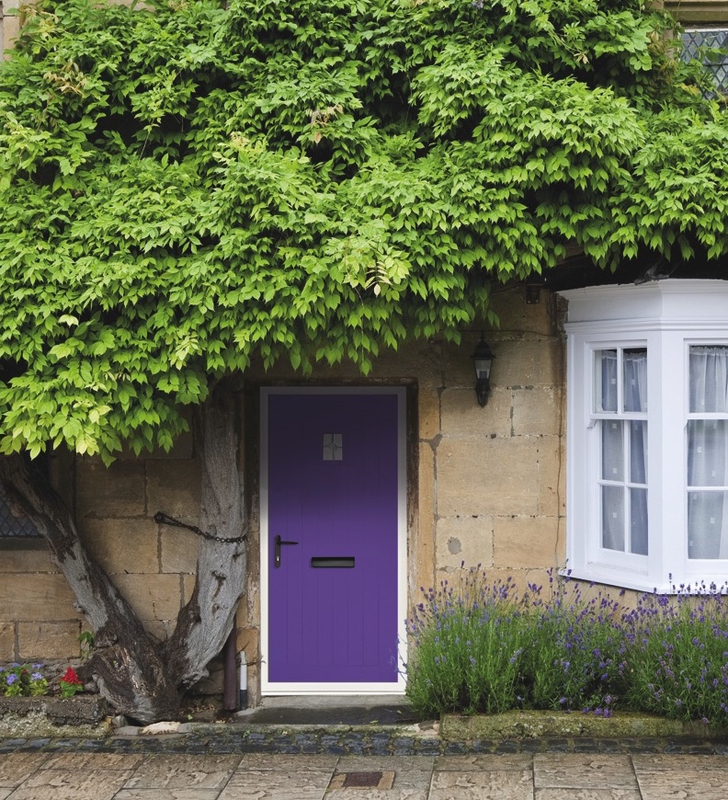 So, whether it’s princely purple, majestic mauve or vivid violet, homeowners can now choose their dream door design and shade without having to lift a paint brush or paint pot themselves, all combined with the security and eco benefits a composite door brings. First impressions are everything and changing the front door is the quickest and easiest way to lift the look of your home, putting a personal stamp on it and even helping to make or break a sale. With his passion for encouraging people to be creative with their homes, George Clarke has also shared his top five tips for boosting kerb appeal in time for spring, whether you’re upgrading to sell or just want to beautify the front for yourself. Homes can look bare and lacklustre once the twinkly lights and decorations have been taken down, so now’s the time to add a dash of spring colour that will look attractive from both the outside and inside. Planters, baskets and window boxes filled with winter flowering plants and bulbs in two to three colours make a good combination. Try primroses, crocus or daffodils, or evergreen foliage such as ivy. Grasses can add height and are good vertical planting options for smaller doorways. Not the most enjoyable task but recycling bins can look grubby, so if you don’t keep them hidden or down the side of the house, do try to keep them clean and tidy. Wash down boxes with warm, soapy water to remove any build-up of mud and dirt, and think about disinfecting compost caddies and wheelie bins too, so they smell fresh. A spot of spring cleaning outside your home like this will pay dividends and keep it looking super-smart. Keep winter’s mud and slush at bay by making the entrance to your home a dirt-free zone. If you live in a particularly muddy area or unmade road, you don’t want this trampled into the hallway so invest in a boot scraper and boot rack for storing wet footwear. Welcome mats are a good way to show your personality and personal sense of style, with seagrass and sisal popular choices. However, man-made materials like plastic, woven acrylic and rubber will be more durable during the wet and cold winter months. Whatever you choose, remember to keep them looking clean and tidy, and free from dust and debris. Winter means getting up and coming home in the dark, so it’s not always easy to spot dirty windows which can cut out a lot of natural daylight. Cleaning glass inside and out on a regular basis will help to maximise the light coming through. A simple, non-toxic mix of water and white vinegar, and a rub down with kitchen towel or a microfibre cloth should do the trick. Show your door some TLC too if it’s taken a bashing from the elements: a quick wash down with a sponge or microfibre cloth and warm water is all you need to keep doors and accessories, such as letterboxes, doorknobs and knockers, bright and clean. Or if your door is beyond a simple spruce up, consider investing in a new one!